Paraphrasing Dave Hickey, who wrote a great essay that accompanies Michael Reafsnyder's latest catalog for his solo show at Ameringer, McEnery and Yohe, Michael is considered a radical, not so much because of how we look at his paintings, but more because he is concerned with how we look at paintings in general. He is a radical who for many years has revived Abstract Expressionism painterly traditions, in his own way. 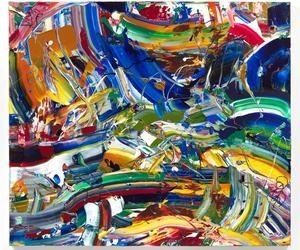 As an abstract expressionist born, raised and established in Southern California, Michael, who counted Mike Kelley among one of his grad school professors, uses super thick layers of acrylic paint on canvas and arms himself with plastic blades - never brushes - to create deep, saturated abstract pieces that are laborious, well-thought out and carefully composed. What at a first glance may seem as a beautiful mess isn't so. Each trace, each curve, each color combination has a reason and a purpose - the same way his color palettes and vibrant candy-like textures come together in a canvas following a methodical process. There are references to Jackson Pollock and Gerard Richter, but the addition of an almost-camouflaged smiley or any other humorous symbol is a reminder not to take art history so serious. The pieces seem to suggest that the suffering and dysfunctionality of the artist doesn’t really affect the work in the end. Michael is really fun and his energy is light. There’s strength and vigor in his words in the same way as his paintings, but he is also unpretentiously California-cool and unfazed by the madness of New York City - LA is home and always ripe with inspiration. Some of the paintings have titles such as Sherbet Slide, Honey Mist and Hot Funk. I can't avoid thinking about carnivals, bright summer days, intense and happy vignettes alive in my memory that evoke glimpses of the colors found in Michael's work. While walking through the beautifully lit rooms of the gallery, Michael and I stop to admire each of the 19 paintings created for the show. He casually mentions that he often feels inspired by that Renoir quote, “Only the painter who knows his business can create the impression that a picture was done in one stroke.” I happen to believe that he isn’t only inspired by these words, he is also their contemporary embodiment.